Kevin Krigger, riding Golden Cents, missed becoming the first black jockey to win the Kentucky Derby, finishing 17th. On May 18, he'll ride Golden Cents again, trying to become the Preakness' first black jockey to win since 1898. Here are 10 things to know about the 138th Preakness Stakes to be run on May 18 at Pimlico Race Course in Baltimore. A maximum of 14 3-year-old colts can run in the 1 3/16-mile race, and the star attraction will be Kentucky Derby winner Orb. The bay colt needs a win to keep alive a bid for the Triple Crown. 1. 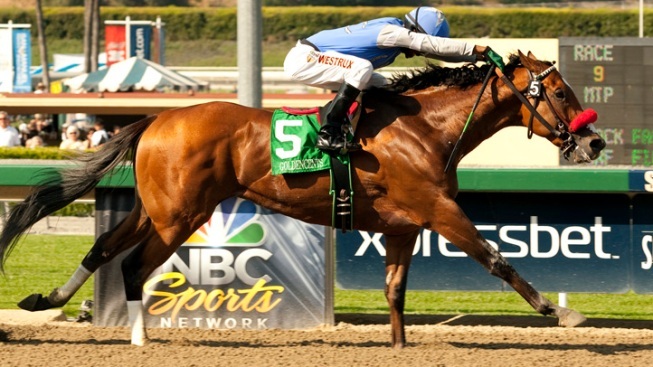 MIX OF OLD AND NEW: The Preakness will feature a mix of horses who ran in the Kentucky Derby and others who are joining the Triple Crown trail for the first time. The likely returnees and their Derby finishes: Orb (1), Normandy Invasion (4), Mylute (5), Oxbow (6), Will Take Charge (8th), Goldencents (17), Itsmyluckyday (14), and Vyjack (18). The likely newcomers: Departing, Govenor Charlie, Titletown Five and Street Spice. 2. DOMINANT CALUMET: Calumet Farm, the Lexington, Ky., outfit renowned for its list of champions, has been dominant in the Preakness. Seven of its horses have won the race, making Calumet the owner with the most victories. Two of its Preakness winners, Whirlaway in 1941 and Citation in 1948, went on to sweep the Triple Crown. Calumet will have its first Preakness starter since Alydar in 1978, with Oxbow set to run this year. 3. LUKAS TAKES AIM: D. Wayne Lukas leads all trainers in Preakness starters (37) and he's tied for second-most wins with five. The 77-year-old conditioner is expected to saddle three more this year: Oxbow, Titletown Five and Will Take Charge. Lukas co-owns Titletown Five along with NFL Hall of Famers Paul Hornung and Willie Davis, and three others. Oxbow was sixth in the Kentucky Derby and Will Take Charge eighth; Titletown Five skipped the race. 4. BAFFERT'S BACK: Bob Baffert makes his 2013 debut on the Triple Crown trail in the Preakness with Govenor Charlie. The Hall of Fame trainer skipped the Kentucky Derby, deciding none of his horses would be competitive enough to finish among the top three. The colt figures to be a double-digit long shot; however, Baffert has won the race five times. He finished second last year with Bodemeister. 5. KRIGGER GOES FOR HISTORY: Kevin Krigger missed becoming the first black jockey to win the Kentucky Derby when Goldencents finished 17th. They'll team up again in the Preakness, with Krigger trying to become the first black rider to win since Willie Simms in 1898. George Anderson was the first black rider to win in 1889. No black jockey has been in the race since 1985. 6. POPULAR POST: The most Preakness winners (15) have started from post position 6; Smarty Jones was the last winner from there in 2004. The colt's 11 1/2-length victory was the largest in race history. 7. FLORAL FAKE OUT: The Preakness winner gets a garland of black-eyed Susans draped on his neck, but the official state flower of Maryland doesn't come into bloom until late June or July. Instead, yellow flowers daubed with black lacquer to resemble black-eyed Susans are substituted. 8. SWITCHING IT UP: The order of the Triple Crown races were shuffled over the years until the current lineup of Kentucky Derby, Preakness and Belmont was settled on in 1931. Eleven times the Preakness was run before the Derby, and in 1917 and 1922, both races were run on the same day. In 1890, the Preakness and Belmont were run on the same card at Morris Park in New York. Eleven times the Belmont was run before the Preakness. 9. TRADITIONS: The U.S. Naval Academy Glee Club leads the crowd in singing "Maryland, My Maryland" as the horses are called to the post. As soon as the Preakness winner is declared official, a painter climbs a ladder to the top of a replica of the old clubhouse cupola. The colors of the winning owner's silks are painted on the jockey and horse weather vane atop the infield cupola. 10. TRIPLE CROWN: If Orb should win the Preakness, speculation and excitement will begin building for the Belmont Stakes on June 8 over whether the colt can complete a rare sweep of the Triple Crown series. No horse has done so since Affirmed in 1978.